About a year ago, a cheesy coloured package was dropped in my lap. At first glance it looked potentially hideous. Little did I know that I had discovered the best-kept pop secret of the moment. "Antology", a selection of demos, was the most refreshing piece of pop I'd heard in a hell of a long time with a bizarre mix of sounds from Buddy Holly to the Human League. 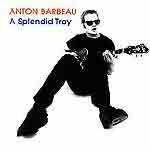 A year later, Anton Barbeau, nerdy by default, but deservedly smug, has released his first full studio album, A Splendid Tray. One can only wonder what the guy is on about most of the time, but then again, it never did Michael Stipe any harm. Here, Barbeau reaches new heights of weirdness in songs such as 'The Banana' and 'Yum-Yum Bubblegum', the token novelty tunes and probably the weakest on the album. But where "Antology" was mostly cutesy and hilarious ("a girl like that treating me like this/better hope I miss when I try to run her over"), "A Splendid Tray" boasts a much darker side. Songs like 'Gone' and 'Suicide Toad' show that Barbeau is not all about falsettos and arse-wiggling antics. The album's finest hour must surely be 'Once in Royal David's City', not a cover of a well known chrimbo anthem, but rather a weird sprawling Dylanesque tale with a lovely 80s synthy sound. Equally engaging in a lower key is 'Sweetness dream of me', clocking in at almost eight minutes, it displays Barbeau's ability to write a non-cynical, achingly pretty love song. He seems to have a curious fixation with animals and often a deeply emotional song is woven around the lives of reptiles ('Suicide toad') and insects ('Cockroach song'). Weird and totally wonderful, Anton has proved his worth in a world of shite bands such as the Stereophonics. It is a pity that so many teenage girls are singing along doe-eyed to covers of Abba songs that were crap in the first place, when they could be losing themselves in this glorious pop. "Splendid Tray" is David Gray with an edge he could only have wet dreams about. It's also measures of Billy Bragg and Elvis Costello sung with a slight Green Day accent, all forgiven in the context. You may not be able to get hold of this album in an Irish record shop such is the injustice of contemporary music.